What exactly is biomimicry? I think of it as a way of unlocking a whole world of super-powers for humanity. It is literally the next stage of human evolution. Leonardo DaVinci himself said, “Those who are inspired by a model other than Nature, a mistress above all masters, are laboring in vain.” Maybe we’ve been studying the wrong master, trying to make a living on this planet in ways that will ultimately deplete us all. That’s certainly the case with humans and honeybees. Yes, humans love honey, and the busy hum of bees in the garden is a sound that gives us peace on a warm day. But we have much more to learn from them. 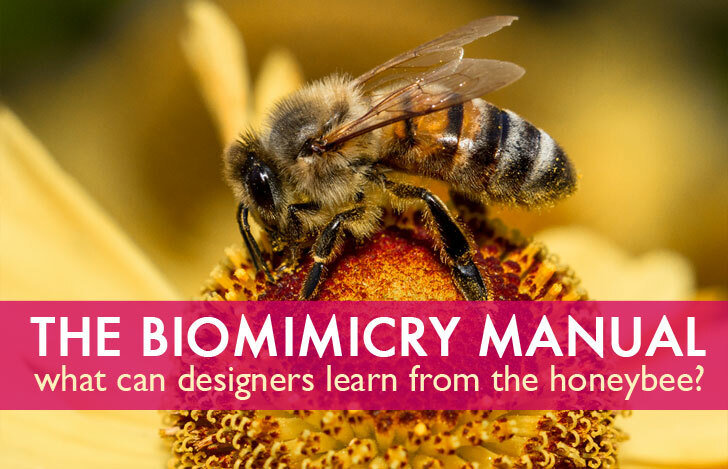 Find out the lessons they have to teach in today’s entry of The Biomimicry Manual! Great designers know that people feel good when they are surrounded by plants and other living things. Gardens are good for the soul. That’s ‘biophilia.’ Nature makes us happy. We love using ‘organic’ raw materials, like honey and beeswax, because they are useful and renewable, pleasing and non-toxic. They won’t sit in a landfill for the next thousand years like yesterday’s plastic. The Earth will recycle them. That’s ‘bio-utilization,’ using nature because it’s just good stuff. Our herds of goats and sheep, the crop varieties we’ve grown and selected for millennia because they taste the way we want, and even the family dog are ‘bio-assistants.’ They help us make and do the things we need. Honeybees, for instance, are not ‘wild animals,’ but domestic helpers. We have shaped their evolution to suit ourselves. Biomimicry is a little different. It only “uses” life’s ideas. It’s when you have a problem, and you ask, “how other living creatures solving it?” Instead of harvesting that creature or its by-products, you copy the idea itself and make it anew, make it human. Every plant and animal, fungus, and bacteria has a whole genome worth of time-tested, sustainable ideas to inspire us. That’s a lot of superpowers. Myself, I like bioinspiration of all kinds. John Todd‘s ‘Living Machines‘, for instance, do a little of everything: biophilia, bio-utilization, bio-assistance, and biomimicry. He uses a pleasing array of living plants and bacteria (both domestic and wild) to imitate the way a natural wetland ecosystems works, filtering and treating sewage in the process. Believe it or not, a bee has to eat eight pounds of honey to make a single pound of wax to safely store her honey and larvae in. It’s an expensive proposition, and it has to be done efficiently. 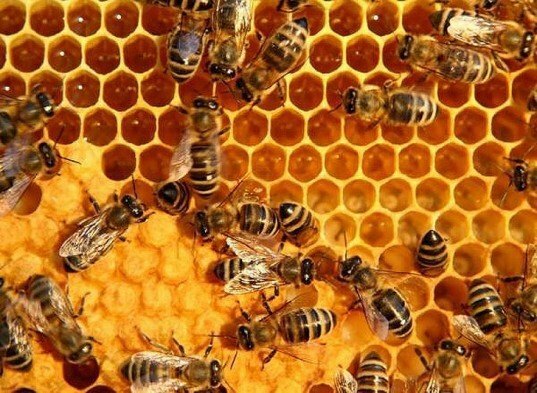 The ancient Greeks understood that modular hexagonal honeycomb makes the most storage possible with the least amount of material. Architects and designers are tapping this for all sorts of applications. Panelite, in New York, offers hexagonal ClearShade insulating glass. It passively regulates heat, while still letting in lots of light. 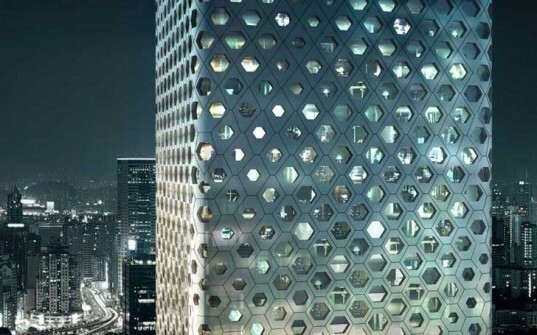 The Sinosteel skyscraper in Tianjin, China uses honeycomb windows the same way. Our honeybee has other brilliant design ideas as well. For instance, her 300 degree field of vision literally gives her eyes in the back of her head. Nissan Motors is working on a laser range finder inspired by these curved, compound eyes, which will detect and avert potential collisions. German researchers are designing a honeybee-inspired wide-angle lens for aerial drones, while other researchers are using their navigation tricks to optimize GPS and tracking systems. We know that it’s physically impossible for bumblebees to fly. And yet they do, with incredible efficiency and maneuverability. So what are we missing? We aren’t completely sure, but one thing they have is the ability to zip and unzip their two-part wings for flight and landing. What if our airplanes could do that? Wouldn’t that save space on aircraft carriers and in busy airports? And when we say something is “the bees’ knees,” it’s even better than we thought. Insect joints contain ‘resilin,’ a springy protein. Turns out to be the most efficient elastic known, dramatically better than natural or synthetic rubber. With it, bees can flap their wings a thousand times a minute, and fleas can jump one hundred times their body length. An Australian government research group has mimicked this “near-perfect” rubber, creating 98% bounce back. That’s practically a perpetual-motion machine! These examples are taken from Jay Harman’s new book, The Shark’s Paintbrush: Biomimicry and how Nature is Inspiring Innovation. There are so many good ideas in nature, it boggles the mind, And that’s just the bees! There is literally an infinite world of time-tested, sustainable ideas to learn from. And if we get “buzz-y” studying them, we can unlock a whole new set of super-powers to take us into the future. Biomimicry is a little different. It only "uses" life's ideas. It's when you have a problem, and you ask, "how other living creatures solving it?" Instead of harvesting that creature or its by-products, you copy the idea itself and make it anew, make it human. Every plant and animal, fungus, and bacteria has a whole genome worth of time-tested, sustainable ideas to inspire us. That's a lot of superpowers. Myself, I like bioinspiration of all kinds. John Todd's 'Living Machines', for instance, do a little of everything: biophilia, bio-utilization, bio-assistance, and biomimicry. 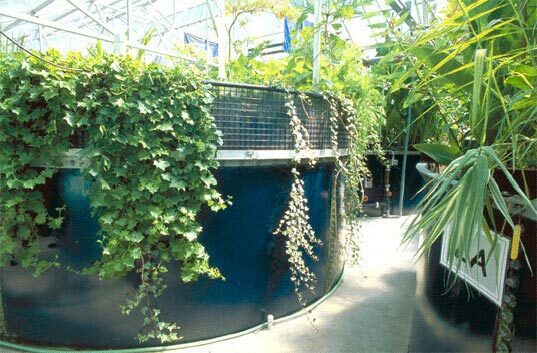 He uses a pleasing array of living plants and bacteria (both domestic and wild) to imitate the way a natural wetland ecosystems works, filtering and treating sewage in the process. We know that it's physically impossible for bumblebees to fly. And yet they do, with incredible efficiency and maneuverability. So what are we missing? We aren't completely sure, but one thing they have is the ability to zip and unzip their two-part wings for flight and landing. What if our airplanes could do that? Wouldn't that save space on aircraft carriers and in busy airports? Believe it or not, a bee has to eat eight pounds of honey to make a single pound of wax to safely store her honey and larvae in. It's an expensive proposition, and it has to be done efficiently. The ancient Greeks understood that modular hexagonal honeycomb makes the most storage possible with the least amount of material. Architects and designers are tapping this for all sorts of applications. Panelite, in New York, offers hexagonal ClearShade insulating glass. It passively regulates heat, while still letting in lots of light. The Sinosteel skyscraper in Tianjin, China uses honeycomb windows the same way. These examples are taken from Jay Harman's new book, The Shark's Paintbrush: Biomimicry and how Nature is Inspiring Innovation. There are so many good ideas in nature, it boggles the mind, And that's just the bees! There is literally an infinite world of time-tested, sustainable ideas to learn from. And if we get "buzz-y" studying them, we can unlock a whole new set of super-powers to take us into the future.